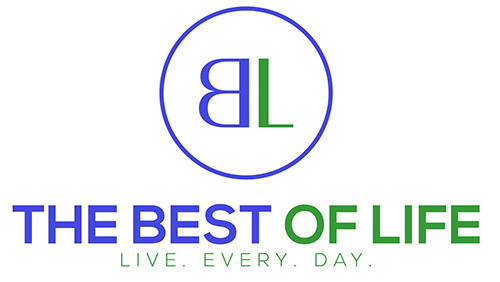 Enjoy a crowd-favorite game day snack that even fits into your 2B Mindset snack plan! 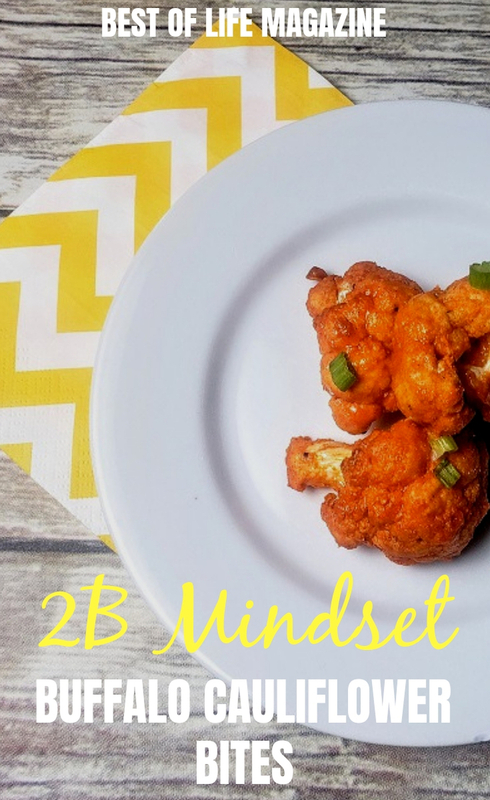 These baked 2B Mindset buffalo cauliflower bites are a healthy and “veggies most” spin on a classic American party snack. With the substitution of cauliflower for chicken, you satisfy the 50% veggies guideline of your optional snack while sacrificing none of the spicy, crunchy and satisfying taste of traditional buffalo wings. 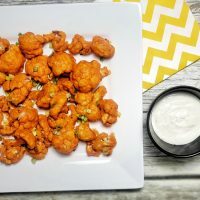 Even if you think you aren’t a fan of this tender white veggie, you’ll reconsider when you bite into these cauliflower buffalo bites that are 2B Mindset friendly. 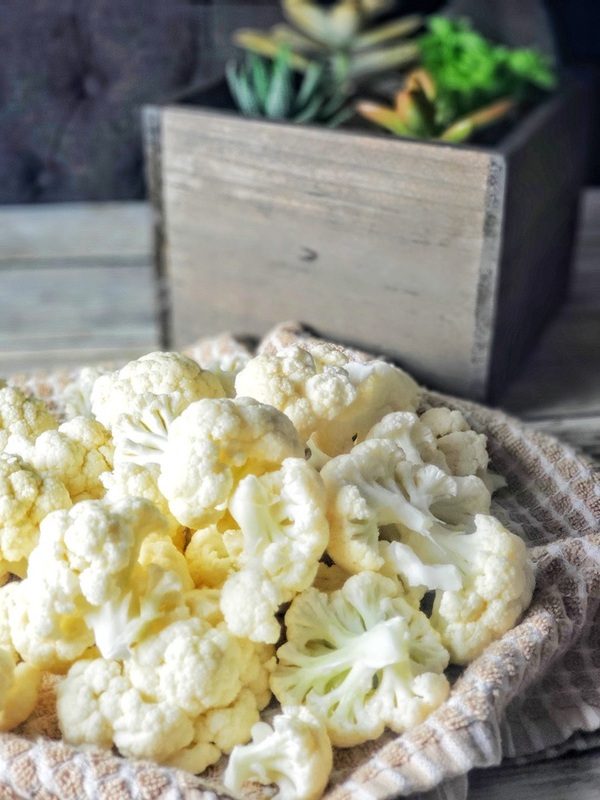 Cauliflower tends to take on the flavors of what it’s cooked with, making it a great veggie substitution for anything from chicken to rice. For this dish, be sure that your florets are large enough to hold up to the breading while still maintaining their shape and texture. For example, if your florets are too small, they will get mushy on the inside and the breading will overpower them. 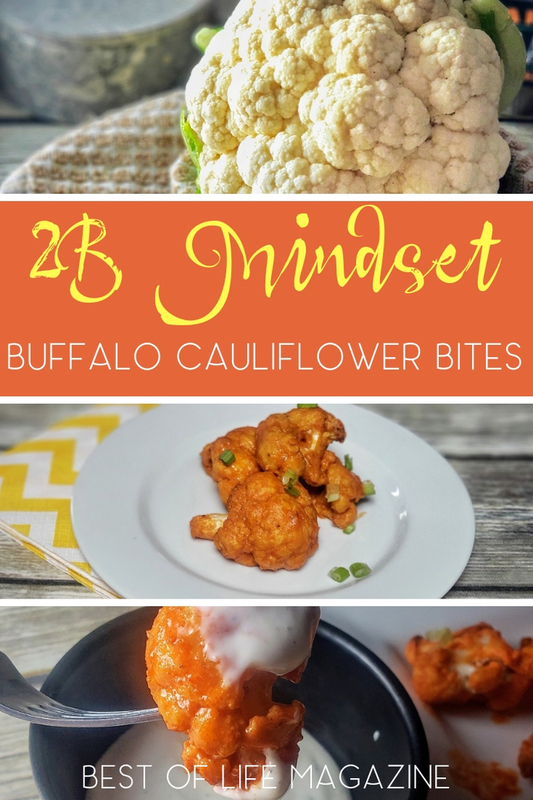 These 2B Mindset buffalo cauliflower bites are best served warm but will keep nicely overnight in the refrigerator — although I have never had any leftover! Serve them up with just a sprinkling of green onion or pair them up with a dairy-free ranch or an accessory from your 2B Mindset Plate It! guide and you’ll have a real winner snack for game day (or any day!). Rather than dredging your buffalo bites in flour like a standard wings recipe, this one calls for Cassava or Almond Flour, or a blend of the two. Cassava flour really gives your 2B Mindset buffalo bites a nice crunch similar to a fried buffalo wing, but almond flour can be a substitute if you are looking to fit this snack into a Keto diet. Combine the flour, garlic powder, salt and pepper into a large bowl. In a separate large bowl, whisk the eggs together. Add the cauliflower florets and combine until the cauliflower is coated with egg. Using a set of tongs or a fork, transfer the coated cauliflower to the flour mixture being careful not to transfer too much extra egg. Gently shake and stir cauliflower into the flour mixture until the cauliflower is coated completely. Arrange the cauliflower onto the baking sheet in a single layer making sure there is a little space between each floret. Bake at 400 for 30-35 minutes or until the cauliflower is tender and slightly browned. While the cauliflower is baking, whisk together the avocado oil and buffalo sauce in a measuring cup or small bowl. When the cauliflower is done, remove it from the oven and drizzled the sauce over the baking sheet. 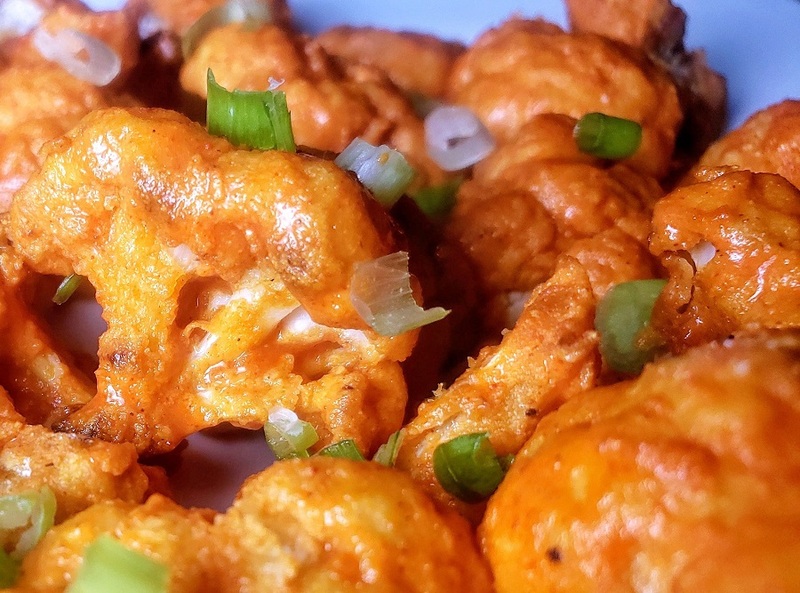 Turn the cauliflower over into the sauce with tongs until each piece is coated with Buffalo Sauce. 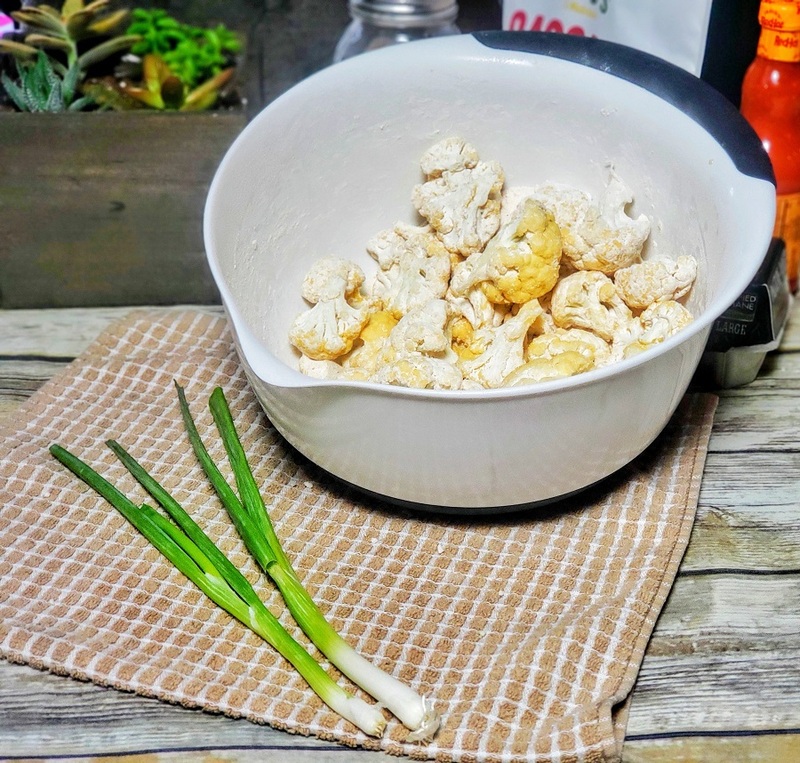 Transfer the Buffalo Cauliflower to a serving dish and garnish with sliced green onion. It’s always optional to serve with a dairy free ranch or dressing of your choice.